The beautifully designed Vaporesso Armour Pro kit boasts a 0.96 inch full colour display offering crystal clear visuals and perfectly placed features on screen. The mod display is also on the actual fire button making a whole device uncluttered and streamline. The mod can be powered by any of the following sized batteries, 21700, 20700 or 18650. Firing up the Armour Pro is extremely quick and takes just 0.002 seconds due to the OMNI Board 4.0 inside the device. 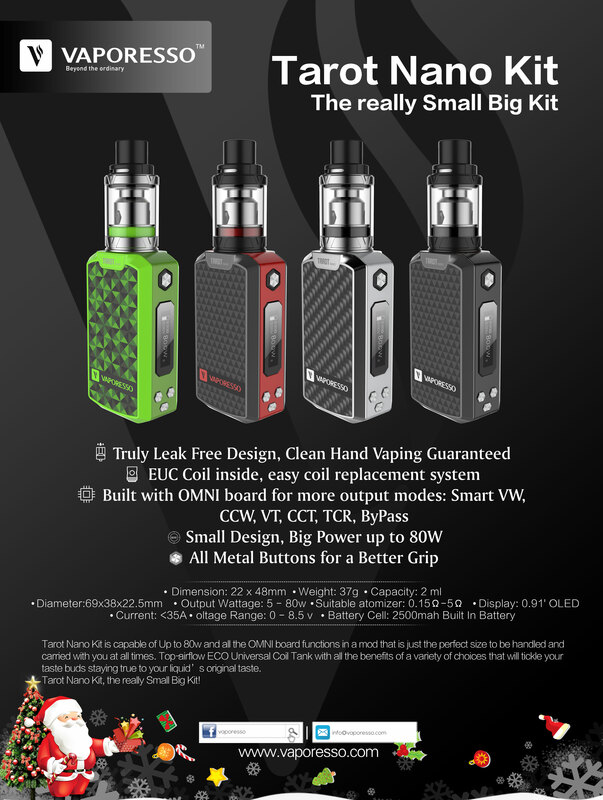 OMNI Board 4.0 is the safest and most advanced regulation chip that Vaporesso have released, giving you fantastic performance without compromising safety with it's Multi-Protections Smart VW (H/N/S) VT (SS, Ni, Ti) TRC M1, M2) BYPASS / CCT / CCW/VV / CCV. 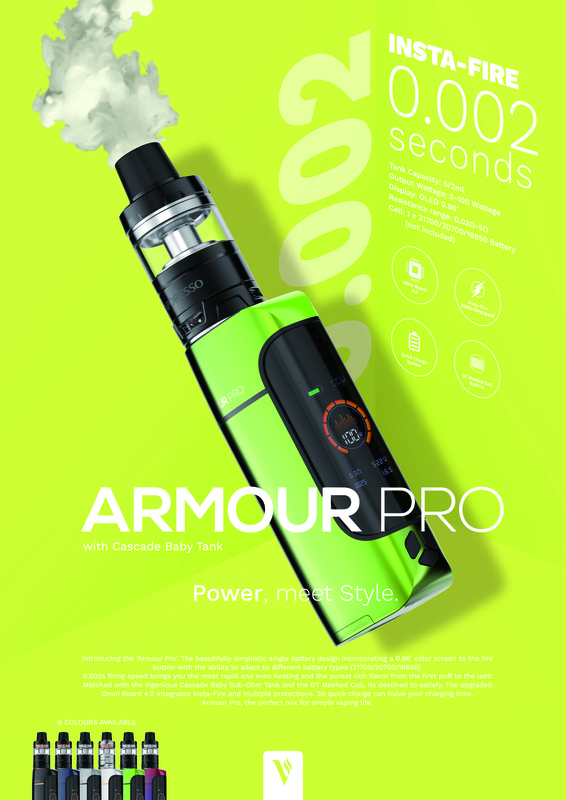 To complete the Armour Pro Kit is the pairing of the Vaporesso Cascade Baby Tank. The Vaporesso Armour Pro comes as a complete kit with the latest 2ml or 5ml (if rubber insert is removed) Cascade Baby Tank to ensure you get the best Sub-Ohm vaping experience possible. Using a new Isolating Structure and Triangular Air-Flow the isolation structure separates the coil and juice chamber giving a more consistent, intense flavour. Triangular Air-Flow uses 3 air flow slots instead of the 2 on conventional tanks, giving a much smoother draw and denser vapour production. Cascade Baby tanks use a top filling system that makes topping up very simple and leak free due to the safety locking mechagnism built into the top of the tank. Once you have filled the Cascade you twist the top and it automatically locks into place preventing you from accidentally opening it. You won't find a better selection of coils than the Vaporesso GT Meshed Range, offering 6 different compatible mesh coils for you to choose from. Mesh is the next generation of coil giving you much more flavour and a more evenly heated surface when compared to traditional coils. Flavour production from mesh is truly amazing. Can’t fault this mod, it does everything you could want, looks sleek and performs superbly. Great all round product.